Marcus pushes the sheaf of poetry towards Veronius. He doesn’t need more of an invitation than this. Veronius sits down at the table and holds up the sheets of the poem one after another, reading aloud. Veronius has two reading aloud voices: a ringing, theatrical one when he is declaiming one of his own poems for an audience, and a more sedate and more pleasant tone used for cases where he doesn’t already know what the next line is going to say. He is using the second voice now. Blood & Laurels is a large, ambitious project using an engine designed by Richard Evans with writing by Emily Short (with many others involved, including Graham Nelson). It involves the era of Rome where bloodthirsty Emperors did insane things. If you’re familiar with I, Cladius it has very much the same vibe. Except, of course, rather than being a static book, you get to direct how the main character Marcus chooses to act. Scheming your way to the top is possible, as well as getting murdered and everything in between. A great deal of the writing feels like a traditional CYOA, only with shorter bursts of text between choices and with the number of choices amped up significantly (the website claims there’s at least 10 times more text than you’ll see on a single playthrough). The plot and writing are spectacular; this is some of Emily Short’s finest work. I say this not only to indicate you should totally buy this if you can (it’s only on iPad on the moment, unfortunately) but also because I’m about to spend the rest of this review grousing about the Versu system itself and I don’t want people to get the wrong impression. I mentioned that Alice is feeling stressed out now that she’s a teenager. When she was a child, she used to always get her homework done on time, and worked hard every day at school. She would often come home from school feeling strained, and the only way she could relax after working that hard was by cuddling her teddy. She’s too old to cuddle teddy now. All she’ll do is hold him, but gets no enjoyment from it. She can’t even pretend that somebody loves her any more. I need human mediation. For me watching mechanical parts converge (even if I get to choose how to direct them) is not a story, but a person can later come and tell a story about (or essentially inspired by) the mechanical world. Even though Versu — the engine behind Blood and Laurels — has AI design by Richard Evans (who did the AI design for The Sims 3) I hoped the play experience would have the element of human mediation is built in the software. That is, I’m imagining the actors in the story are doing their thing in a mechanistic-universe way, but that information is reported by Emily Short who acts as an intermediary and reports with smooth and compelling prose. This dream happened on occasion. The stars aligned such that the prose and the choices meshed in such a way that I felt I was experienced a “text holodeck”. Marcus: And for that you would allow him to turn the City over to destruction? Gila (to Marcus): It’s too bad you’re feeling irritated. 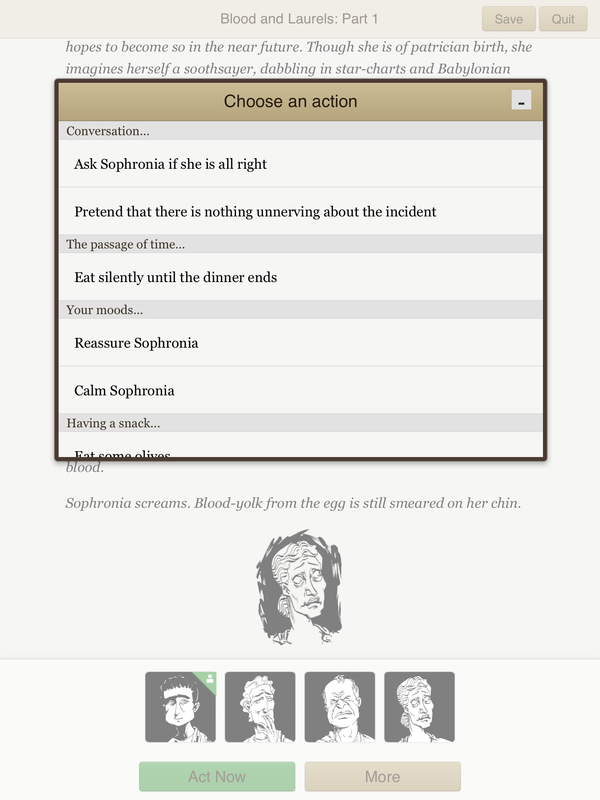 So while Blood & Laurels is extradinarily impressive as a piece of interactive fiction, I remain unconvinced about the potential of the Versu system in general. It is possible this is due to a mismatch; Blood & Laurels has many scenes involving only Marcus and one other character, and the elaborate AI is built to handle much more complicated character situations. Also, despite my grousing there were long sections of prose that were logical and non sequitur-free. It’s also possible Blood & Laurels simply lurks in the uncanny valley. While chinks in interaction are common enough in parser IF that I can skid by them, the narrative thread in Blood & Laurels is strong enough that the cracks are jarring and exaggerated. In that case, all the Versu engine needs is an extra push.